This is the first rule for a very good reason. Good, well made, dress shoes can last many years, if cared for properly. A $150 pair can last 5 years, a $300 or more pair can last up to a decade. Sure, it seems like your dropping a chunk of change when you buy them, but if you price it out over cost per wear, it beats the $39.99 cheapo specials, by miles (pun intended). 2. Match your belt and shoes. This is an old, timeworn rule. They don’t have to match exactly, so don’t go all O.C.D. with it. Get them reasonably close, and you’re on your way. A black belt with brown shoes, and vice versa, is always a bad idea. If fact, I recently saw a doorman at Hotel Zaza Dallas doing this. Crisp black suit, and some kind of two tone brown saddle shoes. He looked like a dork, and so would you. Don’t be that guy. Shoe tress can help you greatly prolong the life of your good shoes. Your feet perspire, the moisture finds it way to your shoes, and wears them out faster. Shoe trees absorb this moisture, and also preserve the shape of the shoes, making them look newer longer. Not wearing the same pair 2 days in a row, enhances this process further. Good shoe trees are made of cedar, and can be found at nearly all department stores. You can use them on your Nikes too, but the real value of these comes with using them on your dress shoes. 4. Have your shoes shined. Your nice shoes don’t look nearly half as nice, when they are scuffed and dull. A semi regular shoe shine helps preserve and protect the leather, as well as make you feel like a million bucks while getting them shined. Nordstrom’s is great for having a shoe shines readily available in the shoe department. I ALWAYS feel like The Man, when getting a shoe shine, and the odds are that you will too. It’s an affordable luxury, nay…necessity for the well dressed man. 5. Don’t wear running shoes unless you are actually running. Save the Nike trainers for the gym or trail. If you are looking for casual shoes, shoot for the Steve Madden, or Diesel type refined sneakers. These kick up you fashion IQ a notch, and you may be mistaken for European. Girls do notice these over the normal type of sneakers, so make these your casual shoe standby. 6. Burn your white socks. This goes in conjunction with #5. The ONLY time you should be wearing white socks is at a white party. That’s it. How many of those do you go to, really? Load up on, black dress and ankle socks, brown, blue, and patterned socks. 7. Purchase shoes that fit properly. Shoes that fit will wear in better, leave no blisters, be more comfortable, and generally last longer. If you need to get fitted for shoes, do so. Any decent shoe department can help you with this. 8. Match thy shoes to the occasion. Leave the Mark Nason rockstar boots and Robert Wayne’s for after hours. They are not appropriate for work. Very few people can pull off sneakers with a suit, and the odds are against you being one of them. The dressier the occasion, the dressier the shoes. Keep sandals to beach duty, and DONT wear them with socks. EVER. 9. Own brown and black dress shoes. Sometimes a certain color shoes looks better with certain colors. This also provides variety in your wardrobe, and keeps you from wearing the same shoes everyday, and shortening their lifespan. Try pairing khakis with black shoes and belt. Do as the Italian do, and pair that navy suit that every man owns, with brown shoes and a belt. Don’t crease your shoes by forcing your heel into them — use a shoehorn. Some stores will give you one for free, and you can also use your belt, or a folded up piece of paper. As and added bonus, using a shoehorn will keep you from buying shoes that are too big. Oh, and your index fingers will thank you. Clean, lace-up, no buckles, buttons, medallions, etc. 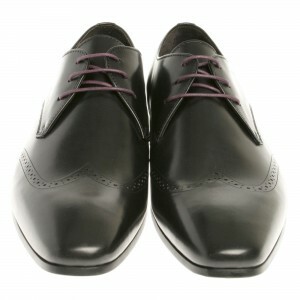 Buy as many pairs and styles as you want for any particular color, but always ensure you own a pair of classic Oxfords. 12. Wear Wingtips and tassels at your own risk. Some guys can pull them off. But let’s be honest: are you one of those guys? 13. Buy leather, or other natural materials. “Man made materials” means your shoes are made of plastic, will make your feet smell, and won’t last long. I’ve never experimented with the more exotic stuff like croc skin, so I can’t comment there. 14. Get your shoes resoled. Shoe repair/alteration/restoration stores. Find a good, reliable one, and stay away from big chains. Find a mom and pop shop with a good reputation This will save you tons of money in the long run. A shoe repair outlet allows you to put more money up front on high quality footwear. Have you ever had a shoe with an upper still in perfect shape, but with holes in the outsole or heel? You can either throw them out and buy new ones, or take them to be resoled for much less money. 15. Enlist a fashionable woman’s help. Most women really do have an eye for what looks good on you. Enlist an impartial female, a spouse, or female friend to help you in this. The results will be worth it. We all know how most women are about shoes. A girls help will put you over the top. What say you? What are YOUR shoe rules? Jeans. A true staple of modern men’s clothing. A good pair can be paired with sneakers, and a t-shirt for a quick trip to the store, or with a blazer for a first date. Simply put, jeans are everywhere, and are worn by most people, including President Obama who was persuaded to upgrade his mom jeans. How then, do we see people in funky pairs like this picture? Below are the 9 Rules of Men’s Denim, to guide you, and a few links to some cool pairs. 1. Don’t attempt to pull off the “skinny jeans” that we’ve seen on a lot of hipsters lately. Very few people can, and the odds are very good that you’re not one of them. Just say no. 2. Choose pre-distressed jeans wisely. They are in vogue as of writing, and a little distressing on your nightlife jeans is fine. The ones you wear on causal Fridays, not so much. If the knees on the jeans are completely cut out, call Eddie Van Halen, and send him his denim back. 3. Wear DARK denim, as it is your swiss army knife of the jeans world. You can pair them with a shirt and be fine. You can also dress them up with nice shoes, and a blazer, and look like THE MAN. This duality is harder to pull off with light colored denim, which is seen as more casual. 4. Choose jeans that fit properly. If you have to struggle with the zipper, and button to get them closed, they are too tight. If they fall down to your knees if you don’t wear them with a belt, they are too big. Somewhere in between is what you’re aiming for. 5. Buy QUALITY Denim. The $14.99 super saver specials from Target or Wally World, just won’t cut it in the long run. Be not surprised if they fall apart very quickly. 6. Do not buy ridiculously over priced jeans. Unless the jeans in the $250 plus range do the dishes, mow the lawn, and fetch the newspaper, there is no real reason to buy them. There are way too many great options available in the $75-$175 range, to make the others really worth it other than conspicuous consumption. 7. Buy your jeans on sale. Yes, it is much easier to walk in, buy what you want, and worry about the price later. Considering that a good pair can last longer than your cell phone, some car loans, and most Hollywood marriages, signing up for email lists, and waiting for a sale allows for a better quality of purchase. 8. Wash your jeans in cold water and turn them inside out when doing so. It sound silly, but it will help the color last a lot longer. 9. Enlist a fashionable woman’s help in buying jeans. Most women really do have an eye for what looks good on you. Enlist an impartial female, a spouse, or female friend to help you in this. The results will be worth it. Trust me on this one. Lucky Brand Slim Bootleg. These are very similar to the ones I LIVE in. 7 For All Mankind : trendy, yet timeless. Pricey.